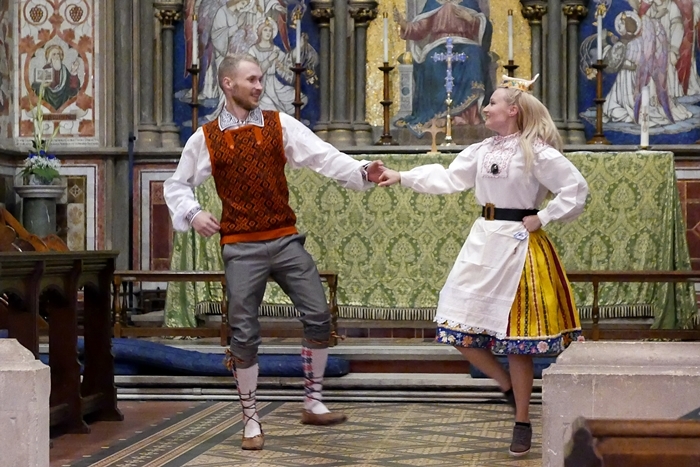 On Sunday evening St Mary’s Church, Riverhead, hosted an Overseas Partnerships celebrations, which this year was focused on Estonia. The evening was full of joy, singing and dancing. The Rt Rev Given Gaula, Bishop of Kondoa, and the Most Rev Urmas Vilma, Archbishop of the Estonian Evangelical Lutheran Church, addressed the congregation. They spoke about the different challenges and exciting projects in which they are involved, and encouraged everyone to continue visiting each other and sharing the God’s love. The London Estonian mixed choir and Estonian dancers were a big part of the celebrations. Tawards the end of the service the choir of St Mary, Riverhead, joined the mixed choir and performed a traditional Estonian song Ta lendab mesipuu polle (It flies toward the beehive). This was a service of celebration, friendship and unity. You are warmly invited to find out more about our overseas partnerships.